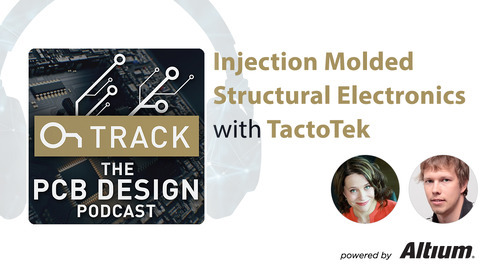 How do you approach PCB stack-up design? What do you do if you have an interference problem? Rick Hartley is an industry leader in the correct design of circuits and PC boards to prevent and solve noise, signal integrity and EMI problems. He consults and teaches internationally and he has taught seminars at numerous conferences, including the IEEE EMC Symposium, PCB West, IPC Apex/Expo and others. He is a past member of the Editorial Review Board of Printed Circuit Design Magazine and has written numerous technical papers and articles on methods to control noise, EMI and signal integrity. Listen to this episode where Rick shares the worst ideas for a 4-layer and 6-layer stackups. He also offers a sneak peek of what to expect at his AltiumLive 2018 Keynote Presentation: The Extreme Importance of PC Board Stack-up. 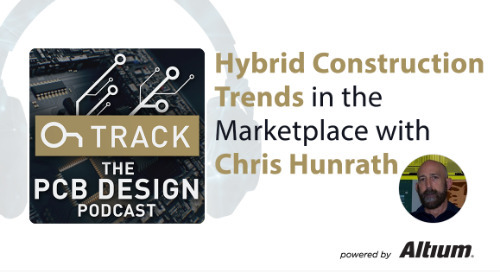 Contest - can you guess how many countries the OnTrack podcast has reached? 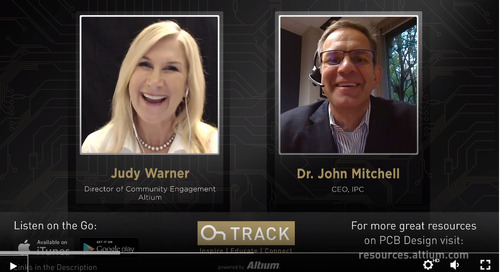 You can win a Summit pass to be Judy’s personal guest at AltiumLive 2018! 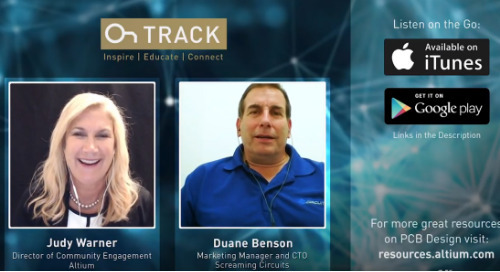 Just tag #OnTrackPodcast on Twitter with your best guess! In the 90s, began to realize the problem wasn’t clock frequency, the problem is the frequency associated with the rising and falling edges of signals. I didn’t learn what I needed in college, it had to come from experience. Energy and Fields and how they move - the energy is in the fields, not in the Voltage and current. The most critical item is the board stackup, and it’s what people most often get wrong. With 2 or 3 signal layers, and then a plane - all signals try to reference one plane, all fields intermingling in the dielectric space, all coupling energy into one another and that’s one of the places where EMI comes from. It’s a matter of keeping fields isolated from one another for proper functioning. Setting the record straight: 15 years ago, Rick wrote a paper called ‘Board Stackup to Control EMI’ and “some ideas that I suggested in that paper, I have since learned are not good ideas.” Ignore this paper because the physics have changed. The speeds have become too fast. 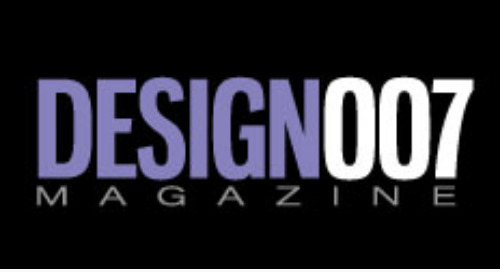 You can also read more about PCB Stack-up Design featuring Rick Hartley in the OnTrack Newsletter, as well as here and here. 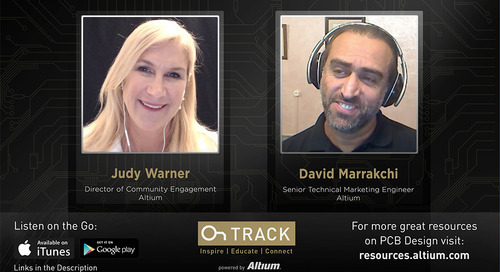 Hey everyone this is Judy Warner with Altium's OnTrack podcast. Thank you again for joining. We want to thank you so much for continuing to listen and we wanted to share with you that from May to June the listenership has doubled and absolutely exploded because I have amazing guests like I have today. Which is Rick Hartley. But before we get going with Rick, I wanted to give a few of you a shout out. 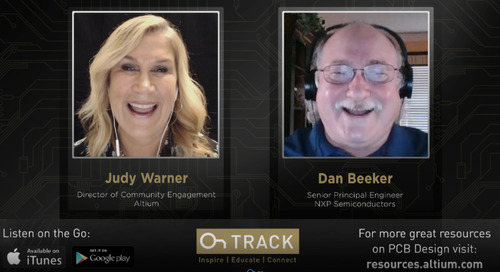 I wanted to say thank you for the notes and ideas for the show that you sent: To Daud Zoss, I'm sorry if I'm killing your name; Dave Rehack, Spencer Kelly gave us some really good ideas for our future shows. Enoch Sotello and also a nice sharp shout out from a LinkedIn group, the Arkansas Signal Integrity community and I'm sure you guys will enjoy hearing from Rick today. So I thought I'd throw a fun thing out there since AltiumLive is going to be hosted in San Diego, October 3rd, 4th, and 5th. I thought I'd give you a little trivia question today. So can you guess how many countries the OnTrack Podcast has reached? If you guess close to the number, then I you will be my personal guest at AltiumLive and I'll give you a free ticket there. So how about that? 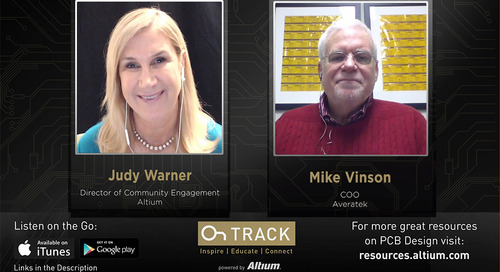 So you can tweet your answers using the hashtag #OnTrackPodcast. So whoever is closest, and we will announce the winner on our next podcast. Thanks again for listening. 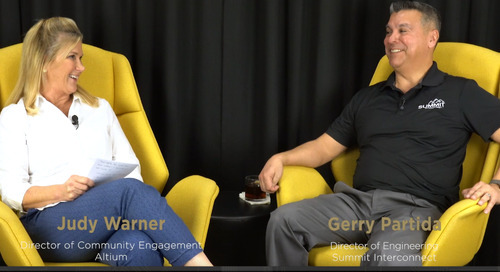 So today we are talking to, in fact, one of our keynote speakers for AltiumLive, a dear friend and longtime associate, Rick Hartley and I'm sure for many of you, he is no stranger and he is a celebrated speaker. He's been a leader in IPC for many years and a very gifted designer. 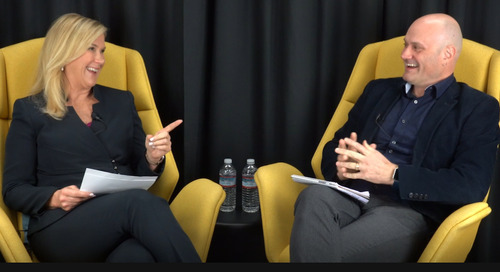 So Rick, welcome thank you so much for joining me today, it's a joy to have you. Thank you Judy, it's a pleasure to be here. So what I thought we'd talk about today Rick, well first let's queue up and tell people who may not know you - the six people on the planet that may not know Rick Hartley - a little bit about your education and your background and sort of how you became a signal integrity guru? Oh, you want me to tell this? I'll try to make it brief. I basically started life in 1965 as a technician with a two-year tech degree and working for a large company in the east, and I spent a couple of years there and decided that wearing one hat a day for six to eight months wasn't what I wanted to do at the age of 20. That I really wanted to be able to wear five hats a day. And so I moved to a small company in Columbus Ohio - I'm still in Columbus - and basically joined an R&D group where I got to do just that. I would be testing boards one day and troubleshooting the next, and so on. Within a couple of years I moved to field service, and from field service I learned a lot about troubleshooting problems and field service as you can well imagine. From field service I moved into the engineering department in that company where I became a designer and as a designer - the designers back then designed everything but the circuit - they designed the circuit boards, the cabinets, the chassis, the wiring harnesses, the interconnects, everything except the actual circuit schematic and I spent a fair amount of time doing that. And then, over time, with school in the evening I earned a degree in engineering became an EE and worked several years as a circuit designer around 1976, seven-ish time frame, the company - I had moved companies by then. The company I was working for asked me to; they said you have some background with printed circuit design? I said yes, we would like for you to help out doing part-time circuit design, part-time board layout. I said, sure no problem. After six months of that, I decided board design was really the thing I liked most. And so I moved full-time into circuit board design, away from full-time circuit design. For a long time I was doing basically RF design, RF layout, which is a little more challenging, especially back then. Digital layout then wasn't too challenging. Anyway moved into board layout, spent a number of years there and along the way somewhere, about the mid eighties, things started to not work right in the digital domain, and frankly, most people didn't know why this was happening. They - most of the engineers I worked with, - were scratching their heads; I was certainly scratching mine. And over time, by doing a lot of reading; I purchased over 120 books since then, between the mid 80s and now, and read them all. Some of them, three or four times, and basically learned what causes things to function versus not function, what causes interference and so on, and probably the person that helped me the most to get to the understanding I have today, is Ralph Morrison, and I'm going to talk a little bit about Ralph as I go through this. But anyway, by just getting my arms around why people have signal integrity problems, why there are interference issues, it's helped me over time to become I guess what people call a guru, I'm not sure I am, but you know whatever, whatever the title is. A good guru will never say they're a guru Rick so it's okay, I'll call you a guru. That's pretty much how I got there it was just a matter of, it was a matter of stumbling along frankly, for years and years - not fully knowing why, and little by little, gathering the knowledge, because sadly, I didn't learn in college, the stuff I really needed to know to take me to where I needed to be. I mean, it had to come through experience, it had to come through just hard-won, hands-on on the job experience. Because it didn't come from college, sadly. And that's kind of where, how I got to where I am today. And of course this all started in the mid-80s. By the mid-90s, I was really beginning to have a pretty good understanding of the issues and it's really all just built since then. And I think, you and I had a talk and you were actually in our OnTrack newsletter a year or so ago, and I remember you saying around that time is, when you... didn't you talk about... oh I'm gonna forget the term now, because I'm not an engineer - rise times. Was that something, was it around that time that you started realizing that rise times were problematic? That's exactly, it was actually in the 90s, when I started realizing that the problem wasn't clock frequency, the problem is the frequency associated with the rising and falling edges of signals. If you have a device on a circuit board, that is being clocked at a low frequency - two, three megahertz, but you have a rise time with two, three, four, five hundred picoseconds, you'll have energy in every transmission event that extends upwards to a gigahertz or beyond, even though you're only clocking at a low frequency. So it isn't the clock, the clock really sets the timing for the circuit. That's really why it's called a clock, it sets timing. The rise times are really the key element that drive signal integrity, and even worse; drive EMI issues and interference issues. It's really all about rise time, yes. That's - I thought that was fascinating when you talked about that earlier. Now I've sat in a few of your classes and I've learned a couple, in my novice kind of way, a couple really key things that really impressed me when I sat in one of your classes at IPC, and in that room of say 50 people, you asked the people in that room: who in this room are EEs and also printed circuit board designers? And a handful of people raised their hand and you asked the question; which one's harder, the circuit design or the board design? And they all like guffawed at that and just said, duh, printed circuit board design. To which someone like me went, wait - I thought the EE was the heavy lifter, the one that kind of got the creds for doing the hard work but you really taught me then, that - and I think this is a lot - because circuit boards have become so complex over time too but that probably wasn't always true - and I had just missed that, that it had become. So why is it that you asked that question, and what made you choose to go from EE to actual board design? The, just frankly, the challenges. I found even in the late 70s, I found the challenges of board design to be more stimulating and more invigorating and it made me feel just more alive everyday to go to work than to be designing circuits and setting up test procedures and that sort of thing. And not that there's anything wrong with that, my god, I asked the question of those guys which is more challenging and most of them said board design. 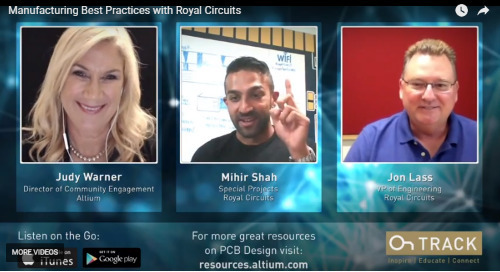 If you ask them which took them longer to learn, they would probably say circuit design took them longer, there's more to understand to become a good quality circuit designer, to really get what it takes to design circuits, to function properly. 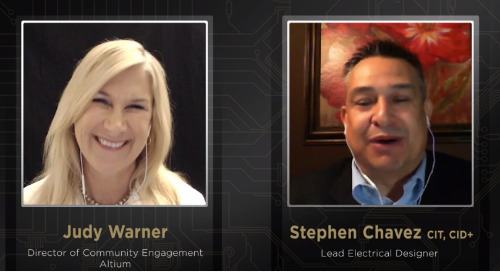 But once you have that knowledge, the actual effort and energy and time expended once you're there - once you're at that knowledge level - is actually greater to lay out a circuit board than it is to do a circuit design and that's why they all answered that way. There was a time when circuit board design was ridiculously easy. I have a circuit hanging on my wall, you can't see it from this camera but it's a two layer board that I designed in 1985. It has no planes and it's just routed power and ground and routed signals it's hideously complex because it's over 200 ICs, on a circuit board it's really packed, and that's why it's hanging there because it is such a complex, by the way hand taped, artwork. It's a very complex artwork and that makes people go 'oooh' when they walk in that's why it's there. But the reality is, how that was laid out was immaterial, because its layout just almost didn't matter, you could do almost anything back then and the circuit would still work. I remember seeing a tape layout in the 1990s, of a guy from the aerospace world where I spent in the early 90s; a board this guy laid out in the 80s, that there was a corner powering ground pin IC for, like a 20 pin part, and there was a decoupling cap sitting above the IC, and he had a trace routed from the decoupling cap, all the way around the body of the IC and back up to the power pin of the device. It was probably an inch and a half long trace from it, and it was a skinny little, 10 mil trace, and the circuit worked. And it's because things were so slow back then compared to today. And it's about rise time not clock frequency. Rise times back then were measured in the tens, in some cases even hundreds, of nanoseconds. Today they're measured in the hundreds of Picoseconds so they are at least a thousand times faster than then - a hundred to a thousand times faster than they were in the 80s and that's why, things today are harder to make work than they were in those days. -then you said, it's okay judy EEs don't know that, and I'm like, okay all right I don't feel so bad. So why don't we know that Rick? Because it's not talked about generally in college. Voltage and current are important parameters, they are - I just had a discussion very recently with Eric Bogatin on this exact subject. Voltage and current are extremely important parameters for identifying how transmission lines work, why signal integrity issues arise. 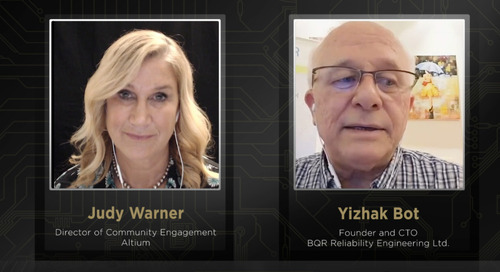 These are all things that you need to know, but the reality is if - and if you're trying to track down signal integrity issues - probably best to talk about voltage and current more than the fields. But when you're trying to identify why an interference problem has occurred, why did energy move from circuit A to circuit B, how in the world did it get over to circuit B? The reason is that, as you just said, the energy is in the fields, not in the voltage and current and the fields travel through the dielectric space between the copper features. And that's the key element. When you route a trace you're routing half of a transmission line, the other half of the transmission line is the plane, usually in most boards today, a plane where the energy returns. So you have the forward current traveling down the trace that you've routed, and you have the return current traveling in the plane directly under the trace that's routing across the board. And that current is being established because there are fields with energy creating the voltage and current in the transmission line. And that's the key element to understand. If the energy weren't in the voltage IRAM, sorry, weren't in the fields; radio wouldn't work. Think about it, radio broadcasting of fields into free space, that get picked up by antenna that focused the energy into a radio. Anything that uses broadcast medium works in exactly that fashion. And the reason it works, is because the energy is in the fields. Now you can capture those fields with copper structures. And when you do, then they will channel through the dielectric between the copper features; that's what an antenna does and an antenna focuses the fields into a center point, that focuses them to a transmission line, to the receiver and that's exactly what an antenna is. So bottom line, because the energy is in the fields, and the fields travel through the dielectric space, that's how things can sometimes spread. If we don't route traces properly, if we route, for example, two or three layers of traces above a plane; all of those trace layers are capable of coupling energy into one another, which causes the fields to then spread to places where they shouldn't be. Or, if you change layers improperly - that's something I'm going to talk about, at AltiumLive, is well - the main thing I want to talk about is board stackup. Yeah so let's just jump in right there I think that's a good place to segue. So Rick is doing, han hour keynote at AltiumLive and the title of his talk is: 'The extreme importance of PC board stack up.' So let's just jump right off there. So you've already started to talk about energy and fields and how they move. Talk about that relative to stack up and why that can be problematic in not so obvious places? Yeah I will, yes the main question that I ask people; if someone contacts me and says: Rick we've got an interference problem of some kind, be it EMI, be it interference between circuits, whatever. I've had, within the last year of it, people contact me to talk about op-amp circuits that were being interfered with by other things in a circuit board or inside a system. Why does this happen is the question that's often asked. The first question I ask them is, what is your printed circuit board stack up? Because the most critical item to get correct, to have correctly done, is the board stack up. Between layers one and two, it establishes a forward current in the trace and a return current - a reverse current, in that. All the other planes, it's like they're not even there. They don't even get used because the energy focuses itself in that tight area, and as I said a minute ago, if you have two or three signal layers and then a plane, now all these signals are all trying to reference that one plane. So all of those fields are intermingling with one another, in that dielectric space and they're all coupling energy into one another, and that's where the interference factor comes from. That's where - it's one of the places where EMI comes from - there are many things that cause EMI, that's just one of the many problems. So it's a matter of keeping fields isolated from one another. That's what we have to do if we expect things to function properly. Well I think, besides your prolific reading habits being an EE, I think, has obviously served you well and so, to understand how fields move and because, like I said, I have a very fundamental understanding of designs and certainly not of field theory and all of that, and how physics work but I think that's one reason why you've been such a popular speaker and consultant. You talked about - or you're going to talk about - and let's kind of tease it up a little bit; is the worst four layer stack up. What does that mean? Well there are actually two four layer stack ups that I'm particularly not fond of. One of them is - and I see this a lot in the automotive and appliance industries - where they will put a single ground plane on, let's say layer three, and they'll put routing with routed power, on one, two, and four. And what we talked about a minute ago, having more than one routing layer referencing a single plane,in this case layers one and two; are both trying to reference the plane on layer three. And the result is the field, even if you route them in orthogonal directions, the traces, the fields will still inter-lead one another and we'll couple energy. And the energy that couples, won't be enough to cause a signal integrity problem if you do the stack - if you just do the routing correctly - but it will still be enough that it can cause EMI problems. What a lot of people don't realize is that it takes as little as eight to ten microamps - microamps, millionths of an amp of common load current coupled into a balanced antenna to cause an FCC Class B, radiated admissions failure. So as it takes that little bit of current to cause an EMI problem, and it doesn't take much coupling of fields to create eight to ten, or even milliamps of noise current. So it's a problem that people need to pay attention to. So that's one of the four layers. The other four layer that's a problem, is the one everybody uses - and that's powering ground on two and three, and the reason that's a problem - if a circuit board is extremely thin - if a circuit board is say 10, 15, 20 mils thick; then those two power and ground planes on 2 & 3 are going to be very close together. And when you do that, when the power and ground planes are extremely tight - a few mils to maybe at most 10 mils away from one another, then you can get away with having power and ground on 2 & 3 or 4 layer. But if it's a 62 Milotic, a 1.6 millimeter thick board, and you have the planes on 2 & 3, they're going to be about a millimeter apart - and when planes are a millimeter apart, there's several things that go wrong. One, we rely on the planes to help deliver power. The planes basically become the low impedance path for power delivery 2 and IC, if you asked a lot of people, a lot of Engineers, where does power come from in a circuit board? Their answer will be the power plane. Of course we know that's not true. The energy comes from the dielectric space between the power plane and the ground plane. Exactly. If the dielectric space is tight, the capacitance will be fairly high but most of all the inductance of the planes will be very low, and when the inductance is low, now you have a low impedance delivery path for power. If the planes are far apart, as they are in a conventional 62 ml thick, four layer board, the impedance is so high it doesn't do a good job of delivering power, and you end up with large LD/IDT voltage drops across the power system that we can refer to as power bus switching noise, and that issue alone can cause signal integrity problems but mostly will cause EMI problems. That's, again, it's like can't, my head's exploding again. Four layer board, 062 - standard thickness of your run-of-the-mill board, I mean this is not fancy, and you're saying this is a bad idea! And I'm like wait, what the earth does not flash? I mean it just that's what it sounds like to me like - it's crazy but it's fascinating and I can't wait to hear - I'm sure you'll dig into this more? Well I'm gonna get into it more because there are routing implications with that four layer board as well. I mean it's worse than just - than just power delivery. If you have a trace routed on layer one referencing the power plane and you want to change layers to layer four, you're going to have to move the reference to the ground plane, which means the energy in the dielectric space between one and two has to somehow move through that board to the dielectric space between three and four. How is it going to get there? And there are people who will say, oh, it uses the decoupling capacitors. Well that's true, if the frequency is low enough. If rise times look low enough, then that's what will happen. That's why for years, we could get away with four layer boards with power and ground on two and three because rise times were so slow. But now all of a sudden, rise times are measured in the hundreds of Picoseconds and that four layer board just doesn't work well. But we're gonna get into that in more detail at AltiumLive. Okay. You also talked about a six layer? -please don't make my brain explode again Rick, but go ahead, tell me the six layer that's a bad idea? The six layer board that everyone uses is signal, plane - like power ground, two signals, the other plane. If you put power into that, they'll put ground on five and then a signal and six. And this is a common six layer board that just about everybody on the planet uses and it's even worse than the four layer board with power and ground on two and three. And we're gonna get into intimate detail at AltiumLive about why. It's about, I mean, think about what we said about power delivery with the four layer board. If you have planes a millimeter apart and that's not good enough, what do you think putting them on two and five, of a six layer board where they're even further apart, is gonna do two power delivery? And now, worse than that, you have the fields between two and five sharing the dielectric space with signals that are on three and four, and all of those fields are saying hello to each other; hey let's get together and party, and they do get together to party and they wreak havoc! And this is a bad board stack, and we're going to talk more about why it's a bad board stack, and then we're gonna get into exactly what to do to fix it. There is a solution. To be able to use that board stack and make it work, and we're gonna talk about how to do that. 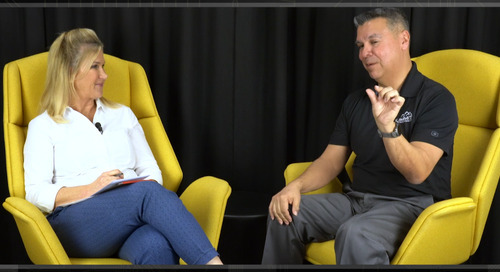 Well I can't wait and I intentionally wanted to have you on today to tease that out because, for those of you that don't know already, Rick teaches all over North America, and sometimes out of the country as well. If you haven't seen it, we will share all these links in the show notes. But he's been teaching, he's been on, at least a North American tour, with a series put on by UP Media called 'PCB Today' and those are two days right, Rick? It's a two day event, and then we go through everything we've discussed here and much, much, much, much more. Right so two days; so I highly recommend UP Media's PCB2DAY with Rick Hartley. We will share that link for any of you that might want to get a full two days. 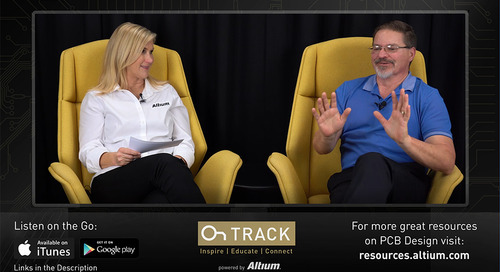 At AltiumLive we're gonna have you drink from the fire hose and give you an hour of Rick Hartley talking as fast as he can. Rick also speaks at PCB West, which is in Santa Clara in September, I think it's September 12 this year, or that week of September. It's a three-day event, again loaded with great content there's an exposition day but Rick teaches more than one class there and they're always packed, so. I'm actually teaching six classes this year. Such talent! And by the way, I want to boast just for five seconds, because I have the neatest friends in the whole wide world. And that is that Susy Webb will also be teaching at all AltiumLive, Mike Creeden will be there; I don't know if he's teaching yet, Eric Bogatin, who Rick mentioned, will also be a keynote speaker , and I think that conversation you were talking about having with Eric, was probably on an email feed that I was eavesdropping on. It was actually just a direct email with Eric because yah, I think you were involved? I got looped in there and, a significant portion went over my head, but it was just interesting to see you guys kind of bantering about your subject. 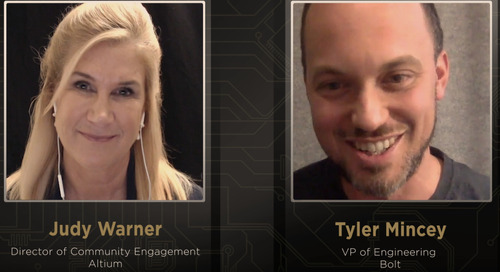 So again, Eric will be one of the other keynote speakers so I'm very privileged to know some very bright, gifted people, and Altium is bringing all these wonderful folks together. So I hope you will join us and I hope this conversation has encouraged you to join us. And we do have early bird pricing, which is like ten percent off through the end of July. So please be my guest we will - - Rick has shared links with us to other resources. Oh! You wanted to mention something about a paper that's floating out there, that you no longer endorse. So why don't you mention something about that? Yeah about 15 years ago, I wrote a paper called 'Board Stack Up to Control EMI,' and while the basic content of the paper is more or less correct, some of the board stacks that I I suggested in that paper; I have since learned were not good ideas, and in fact, the four layer and six layer that we just talked about, are two of them, that I recommended in that paper, because I believed at that time, that they were the right thing to do. I've since learned why they aren't, so if you happen to stumble across that paper again; it's called ' 'Board Stack Up to Control EMI,' ... or to help control EMI, something to that effect, and if you stumble across that, just ignore it. Ignore it cause we're gonna get Rick Hartley 2.0 where things have gotten faster and he's, I don't know that you've gotten smarter; I think just the physics of the boards people are designing have changed. You know, what I want to say about Rick Hartley and people like Susy Webb, Mike Creeden, Eric Bogatin; we are all - you all as designers and engineers are really standing on their shoulders and they used to do this stuff by hand. So I have the neatest photo ever of Rick Hartley with a big fat 70s tie I think, handling out the biggest board ever that I've seen - the biggest tape up I've ever seen. It is, that's the one? So I'm going to share that and the links too because you guys that just have snazzy racy tools and you started designing ten years ago won't believe the stuff these guys and gals did by hand. 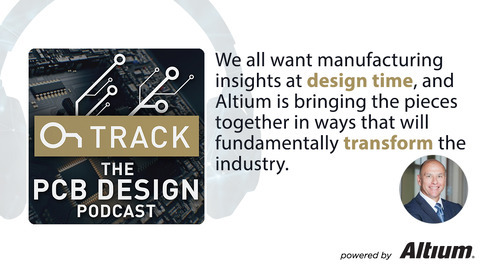 So, well Rick we totally and completely look forward to AltiumLive, thanks so much for agreeing to come and invest in the design community, and thanks again for doing this podcast you are a dear friend. Judy, thank you so much for having me. Yeah and thank you so much for all that you do for the industry Rick, we really appreciate you. 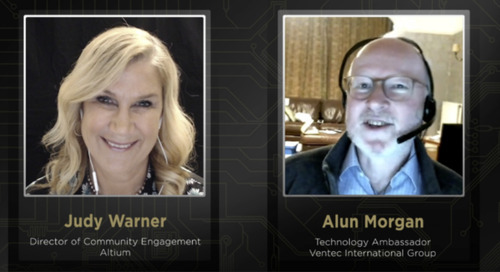 Again this has been Judy Warner with Altium's OnTrack Podcast and Rick Hartley of - how do you say that? We look forward to seeing, or we look forward to you tuning in next time. Until then, remember to always stay on track.